The U.S. Center for Disease Control (CDC) recommended on April 27, 2009 that U.S. citizens defer all nonessential travel to Mexico because of the outbreak of H1N1 “swine” influenza. The CDC Travel Notice which advises U.S. citizens of the health risks that may be involved with travel to Mexico and provides a list of precautions travelers and U.S. citizen residents in Mexico can take to reduce their risk of infection can be found at the CDC website at http://www.cdc.gov/travel/contentSwineFluMexico.aspx. The U.S. State Department has issued a travel alert that can be found at http://travel.state.gov. On April 27, the Government of Mexico announced that as a precautionary measure, all schools throughout the country from kindergarten through university level will remain closed until May 6. All government-sponsored events involving large crowds in Mexico City have also been canceled, and museums and most tourist attractions are closed. The U.S. Embassy in Mexico City and all U.S. Consulates throughout the country have suspended all non-essential services to the public until May 6. Consular services for U.S. citizens will be limited to emergency assistance and to citizenship applications (passports and consular reports of birth abroad, or CRBA). Notarial and other routine services will not be available; anyone with passport or CRBA appointments is encouraged but not required to reschedule to a later date. Additionally, Federal Benefits Units are requesting all persons to postpone interviews on Social Security claims. The Consular Agency in Cabo San Lucas will remain open for emergency services only. The Consulate will monitor this situation continuously during the week and advise before May 6 if this suspension needs to be extended. Consulate General Tijuana’s visa unit has suspended all nonimmigrant visa appointments until May 6. The Consulate will reschedule all nonimmigrant visa appointments which have been made between April 27 and May 5. Our scheduling center will call or e-mail applicants to reschedule appointments. Alternatively, applicants may re-schedule visa appointments without being charged by calling 01-800-719-2525. If there is an emergency visa issue please email TijuanaInfo [-at-] state.gov. If visa operations need to be suspended beyond May 6, we will inform the public as soon as possible. A separate notice about immigrant visa appointments at the U.S. Consulate General in Ciudad Juarez will be issued on April 28, 2009. The Benjamin Franklin Library will be closed to the public. For additional information, please consult the State Department’s website at www.travel.state.gov, the CDC website at www.cdc.gov, or the website of the World Health Organization at www.who.int. The U.S.-based call center for U.S. citizens can be reached from 8:00 am – 8:00 pm Eastern Daylight Time, M-F, at 1-888-407-4747, or if calling from outside the U.S., at (202)-501-4444. The U.S. Embassy will post additional information as it becomes available at: http://mexico.usembassy.gov, as will Consulate General Tijuana at tijuana.usconsulate.gov..
For after-hours emergencies only: From Mexico dial 001 (619) 692-2154, From the U.S., dial (619) 692-2154. Amerimed Clinic Announcement (courtesy Baja Pony Express) - Dr. Cevallos and I have been investigating this swine flu and we have been notified by Amerimed the following facts about this “Swine Flu Epidemic” so I’m passing it on. The Swine Flu (originated in Vera Cruz) is affecting healthy adults, middle aged, as well as those with compromised immune systems. The initial symptoms after 24-48 hour incubation include “cold symptoms” with runny nose, nasal congestion, cough with or without phlegm, sore throat, fever >100.3* F ( 38* C) muscle and joint aches, headache, shortness of breath. The VIRUS can live up to 2 weeks on dry surfaces like grocery cart handles, ATM machines, door handles so direct personal contact is not the only transmission. Diagnosis is symptomatic with confirmed sputum culture, chest X-ray and CBC. Prevention is the key by avoiding large gatherings, public places, airlines, or contact with ill appearing friends or general public unless you wear face masks. Hand washing is essential after contact with any objects that may be exposed by general public. The treatment “Tamiflu” is NOT available here in Baja but at present only in Government hospitals in mainland Mx. NO private institutes have availability because the Government is giving FREE treatment and they want to avoid black-market pricing. No vaccine is available for this strand and if you had flu shots last season it will not cover completely this strand but will give at least 60% coverage. However, if you receive a flu vaccine it will weaken your immune system for up to 3 weeks. Amerimed just ordered a supply of this years flu vaccines and will be arriving Thursday. Well cooked pork is not the carrier but the importation of all PORK products has been suspended. If you suspect that you may have been exposed or have symptoms go to the nearest medical facility for treatment and testing. We are making an effort to obtain the rapid tests at Amerimed but at present only sputum cultures which take 5 days to incubate. Treatment will be available if confirmed cases hit Baja SUR but at present no cases have been confirmed yet. All suspicious cases are going to La Paz for testing. Not all colds are this flu so no need to panic, just use common sense and good prevention techniques. All the private Medical facilities in Cabo are having a meeting to come up with a plan in the event even one case is confirmed so we can quarantine and test. If you have any doubts get tested as soon as possible. Cabo Mil Info (Courtesy Baja Pony Express) - Click on this link tinyurl.com/cp3csr for the current Swine Flu Google map, prepared by "niman", a biomedical researcher in Pittsburgh, PA, USA. It is updated regularly. Legend: Pink markers are suspect. Purple markers are confirmed or probable. Deaths lack a dot in marker. Yellow markers are negative. A panel of physicians will appear on "Los Cabos Now" tomorrow, Wed April 29 from 5:30 to 6:00 pm to separate Swine Flu fact from fiction, discuss preventative measures, and update listeners on the latest data. No radio? Log on to: www.cabomil.com.mx and click on "Listen In" on the English home page. Dr. McAllister will be on Cabo Mil at 5:30 pm Wednesday with the latest update. Urgent Road Warning For Wide Trailers (courtesy Baja Pony Express) - I just arrived La Ventana 10/26 via Highway 1. I hauled my wide trailer. Wider than a full size pickup truck. If your boat trailer, trailer, or vehicle is extra wide I would not drive it down south right now. Where they are doing the new construction and really widening the road an hour north of Cataviña it is not safe to go southbound there with a wide trailer. They have the road torn up and two full size vehicles cannot pass opposite directions at the same time in 3-4 different stretches. It is broken into the road enough that if you meet a bus or semi you just lost your vehicles and possibly life. I made it by going 5 mph and stopping. So it is the ultimate roulette. Not worth it. I would not allow any friend to drive a wide vehicle on this stretch what so ever cars and trucks are absolutely fine, just some white knuckles, as a stretch of a quarter mile there was a 3-5 foot sheer drop-off as they removed the road to the west side completely. I do not know if it was just the weekend or what but it was a Saturday and there was no work being done on this section. I highly recommend people post updates to this construction progress for travelers with wide trailers safety. One who acquires real estate property in Mexico must abide by the rules which are made by SEMARNAT regarding the use of the land, forestation, etc., etc., and if one does not PROFEPA will send an inspector who will make a report, said report once analyzed will generate a RESOLUTION which will either emit a sanction or not. A notice of an inspection, the inspection, the study of the findings, the emission of a decision, the notice of the fine and request for payment; if payment is not done SAT which is the IRS of Mexico will do procedures to seize the property. At times one can exchange the fine for community benefit or work. Thus one must know when and if a resource person, with the appropriate knowledge, needs to be contacted before starting a building project anywhere in Mexico. The answer to this is very easy: When ever one changes the environment, by this we mean cutting down shrub, tree, or planting new trees, building any construction. The other question is how to do this or who to contact for such work. There are a number of experts in the environmental field and one can easily find such experts by going at any SAMARNAT office and ask what must be done. At times the law will require one to have an environmental study done; this work is carried out by persons who are recognized by SAMARNAT as expert in their field. What one must do if there is an inspection done on the property? First of all let the inspector do his job, second provide accurate information and third wait for the resolution. Once the resolution has been served two avenues are open: Pay the indicated fine in one payment or make an arrangement with PROFEPA, the second avenue is to appeal the resolution, to do this one has a number of days to present the appeal and follow very strict rules of law thus the need of a lawyer who is an expert in such matters or better a legal firm which has several lawyers who are qualified to do the job (two brains better than one). Bat Deterrent Light (courtesy Baja Pony Express) - If you have bat problems, you can just leave a small night light on and they will leave ( not roost). The URL below is for a small florescent night light that uses almost no energy, is automatic, and does keep the bats out of our 2000 sq. ft. of palapas. The ones I use are the cool white. It only takes one for a large area. We had bat guano everywhere prior to using them (2). We have to supply our own electricity, so are quite energy conscious. 8 Hp Evinrude Outboard Stolen - Wanted: My 8hp Evinrude 4 stroke outboard was stolen off my aluminum skiff at La Pastora, north of Todos Santos. The motor was chained and locked to the skiff in my carport. The motor is dark blue and practically brand new with only approx. 40 hours on it. If anyone has seen this motor for sale locally please let me know ASAP. Movie Night At Buena Vida Wednesday - This Wednesday we will be showing another one of my favorites "The Escapist" at 8:00pm. Pan D Les Bakery In La Paz - Now that the temperature is starting to rise, the bread guy will be open from 8 until one Monday through Friday and until 2 on Saturday. The bakery is in downtown La Paz on Madero street at Ocampo and can be identified by its yellow and white striped awning. Parking is most difficult between noon and one so plan your visit accordingly. Alta Cocina Mexicana Presents “A Study Of Chiles” A Gourmet Cooking Class With A Bite! - Chef Dany Lamote and Vivianne Jauregui Mariño are joining talents and cultures to teach a 5-course Mexican traditional and fusion style dinner. 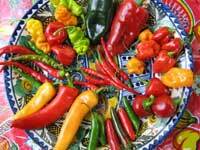 Mild, medium and spicy peppers are the focus. We can easily accommodate vegetarians and people with special dietary requests. Queso manchego, Brie, Baja Chardonnay and chile poblano soup drizzled with cayenne infused olive oil. Stuffed jalapeños with crab with chipotle-tequila mayo. A palet cleanser of nopal salad, jicama and queso fresco served with orange, mango and chile de arbol sorbet. Fried plantains drizzled with cajeta served with coconut ice cream, fresh strawberry-chile piquín salsa and star anise infused tequila. Fully Stocked Rv Is Perfect Guest House - "Rosita" is an RV and more: a guest house, a spare bedroom, a bodega. Having lived in Todos Santos since 2003, she's a true Baja girl who needs a new owner because I now live on the mainland. She's a '69 Ford Lazydaze and from the outside, she fools thieves because they'd never guess how cool she is on the inside. She sleeps four and has A/C, a SOLAR panel, a 4-burner propane stove and OVEN, a double sink, a bathroom w/ porta potty and shower, TONS of storage, TWO tanks for gasoline, and a strong, healthy engine. New water pump needs only to be hooked up. Her Dometic fridge stopped working last time someone stayed in her but could be fixed or replaced. Her tires are great. She comes fully stocked with things like toaster, coffee maker, plates, glasses, pots, pans, canopy and much more. They truly do not make 'em like her anymore. Free Psychocalisthenics® Class - APRIL 27th - MAY 1st .PSYCHOCALISTHENICS - If you have been curious about these exercises..this is your last chance until the Fall. Psychocalisthenics is easy to learn. Come April 27th and take the first class for FREE with no obligation to sign up for the rest of the week. Psychocalisthenics awakens our organism in a serial fashion and produces a flash of vital energy through all of the muscles, organs, glands and tissue resulting in complete revitalization. Each exercise has a precise movement and breathing pattern that promotes anti-aging, improved health, mental clarity, emotional balance, expanded happiness, and increased agility. The series will be taught over 5 consecutive days, 3:30-4:45 P.M. at La Arca. Once learned, you will be able to practice on your own taking 15-20 minutes to complete the series. Tuition $650 pesos. Repeats half price. and i am available for in home nursing care under my current New York State Registered Nurse License. (3rd party insurance accepted). Massage is not strictly for "pleasure" nor should it be connected to sexual activity. Massage has many natural benefits to the body, soul, spirit and heart. Massage is a safe way to relax and have a healing experience under the hands of an experienced therapist. Massage benefits medical conditions such as diabetic neuropathy, high blood pressure, poor circulation, neck, back, shoulder, hip pain, headache relief. References provided. $50.00US for the hour. For more information, please visit our site online at http://www.todossantostechnologies.com or contact Alan at alan [-at-] TodosSantosTechnologies.com, US Office: 530 903 4257, Mexican Office: 612 145 0364 and 530 313 5225. 2100 Sq.ft. House For Sale By Owner - This beautiful, well appointed former showhome features a main floor master suite, spacious living and dining areas, granite kitchen and adjoining laundry room. Upstairs you'll find 2 more large bedrooms, a cozy family room, 3-piece bath and 2 balconies with a glimpse of the Sea. Nicely landscaped yard with huge private terrace and covered parking in a small gated privada. All this and more in an upscale neighborhood that's close to the marina, beach, shops, airport and everything else this charming Mexican 'city of peace' has to offer!